Heat the vegetable and sesame oil in a large wok or frying pan. Add the cumin seeds and wait for them to sizzle before adding the onions. Cook the onions until they begin to colour and mix together the ginger and garlic pastes along with the green chillies. Add the chicken and cook for about 3-4 minutes on a medium heat. Add the mushrooms and carrots and cook for 1-2 minutes before adding the bean sprouts and sweet corn. Add the turmeric, red chilli powder, allspice, white pepper, salt and soy sauce and cook for 5-7 minutes. Add the coriander and garam masala and cook for a final minute or so. Remove from the heat and strain the filling, leave to cool whilst straining. To make the glue mixture for the spring roll pastry sheets, mix together and flour and water so that it becomes a thick paste, leave to one side. When the filling is completely cool and dry (pat dry with kitchen towel if need be) start to fill the spring rolls. 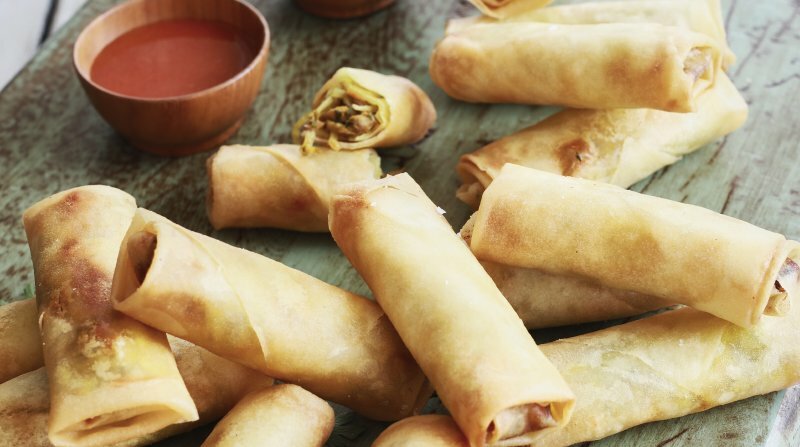 To fill, lay one spring roll sheet at a time on a flat surface diagonally with one corner facing the top and another corner shall thus face down. Spoon a tablespoon of filling onto the bottom of the pastry sheet, approximately about 4cm away from the bottom corner (mixture should be put across the pastry width ways). Fold up the bottom of the pastry so it rolls over the filling until ¾ of the way up, then fold over the right and left side of the pastry to cover the middle of the roll forming. You should have a triangular bit left to fold over. Before you fold the remaining pastry up, using your finger paste the flour and water glue mixture (about a teaspoon) over the pastry and then fold up the spring roll to close. Repeat this for the remaining spring rolls. Once all the spring rolls are filled, deep fry (165°C) until golden brown and crisp, this should take 6-7 minutes. Alternatively, you can freeze the spring rolls and fry when needed or if refrigerating they will stay for up to 3 days. Serve and enjoy.